The trend goes back a long way. 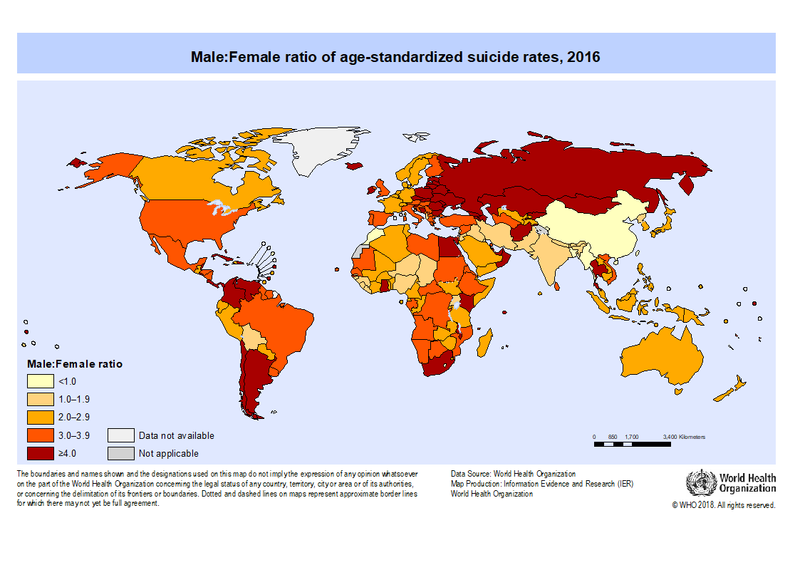 “As long as we’ve been recording it, we’ve seen this disparity,” says psychologist Jill Harkavy-Friedman, vice-president of research for the American Foundation for Suicide Prevention, a health organisation that supports those affected by suicide. “There tends to be more substance use and alcohol use among males, which may just reflect the distress they’re feeling – but we know it compounds the issue of suicide,” says Harkavy-Friedman. Other risk factors can be related to family or work. When there’s an economic downturn that results in increased unemployment, for example, there tends to be an associated increase in suicide – typically 18-24 months after the downturn. One 2015 study found that for every 1% increase in unemployment there is a 0.79% increase in the suicide rate. Another risk factor is a sense of isolation, as physician Thomas Joiner writes in his book Why people die by suicide. This can manifest itself in every walk of life. The outwardly successful professional who has prioritised career advancement to the detriment of all else, including social relationships, may find himself “at the top of the pyramid, alone,” says Grunau. Of course, it is important to remember that while an external factor might precipitate suicidal behaviour in a person who’s already at risk, it’s never the sole cause. “Millions of people lose their jobs, almost all of us have lost a relationship and we don’t end up dying by suicide,” says Harkavy-Friedman. Overall, there’s an emphasis on “making it okay for men to talk about how they’re feeling – and for that to be acknowledged as a sign of strength”, says O’Driscoll. But there are positive signs. Harkavy-Friedman notes a huge change on the professional side, recalling at the beginning of her career it was hard to get a paper accepted on suicide because it was thought that you couldn’t prevent suicide, she says. Now, we know that to be wrong. She also points to more government involvement than ever before. On World Mental Health Day in 2018, the UK government announced its first suicide prevention minister. “The UK has been ahead of the game, every step along the way,” she says, adding that she believes there has been a decrease in the UK suicide rate because a national strategy has been implemented.